It’s a little late to ask, since he’s in his seventh decade, but I have a brother who’s six years older than me, and I wonder if he ever would have given up his career to help me be a success in mine. If you’re wondering why I’m wondering, it’s because I marvel at the fact that this is just what Brittany Henderson has done, and continues to do, for her sister Brooke. Brooke, as you may know, just finished tied for 39th in this past weekend’s Manulife Classic in Cambridge, Ontario. Not a performance that she would be happy with, for sure, but a solid four days nonetheless. How exciting it would have been to see her win before her “home-town” crowd (even though home is actually about 4 hours away from Cambridge.) Some day, I’m sure, this will happen to Brooke… she’s too good at the game, and too buoyed by the Canadian crowds, not to let it lift her over the top on home soil. No one would have been more excited about a victory this weekend than sister Brittany, who’s been caddying for Brooke all this season, her first full campaign on the LPGA Tour. Prior to this year, Brittany herself was a rising star on the second-tier Symetra Tour, and while her results hadn’t been nearly as stellar in tournaments as her younger sister’s (Brooke turns 19 this week, Brittany is 25), she had a realistic future ahead of her. But Brittany recognized that a different future lay ahead. When Brooke earned her LPGA Tour card 13 months ago, the family (including father Dave and mother Darlene) looked at the challenges facing their youngest daughter. To be 18 and out on tour all by herself would have been daunting to say the least. The LPGA Tour is full of nice and supportive women, but it can also be very competitive and frosty on the course, and very scary and lonely to be traveling to different places – including different countries – as a teenager. To have two daughters playing on two Tours would have proved a huge challenge for the parents, to split their time evenly for their girls. The solution? Brooke seemed to have the brighter future (and therefore, the higher earning power), so Brittany would become Brooke’s full-time caddy. And as her older sister and best pal, it follows, she would also serve as coach, therapist, playmate, soul mate, confidante, and support. No one could ask more of anyone, but Britt readily agreed to make the sacrifice. Obviously, the sacrifice has worked. Brooke has three victories on the LPGA Tour, including the Women’s PGA; has a bag full of Top-10 finishes in her first year; is currently ranking third in money earned ($1.35m); and third in worldwide performance. No other Canadian golfer comes close to these results. 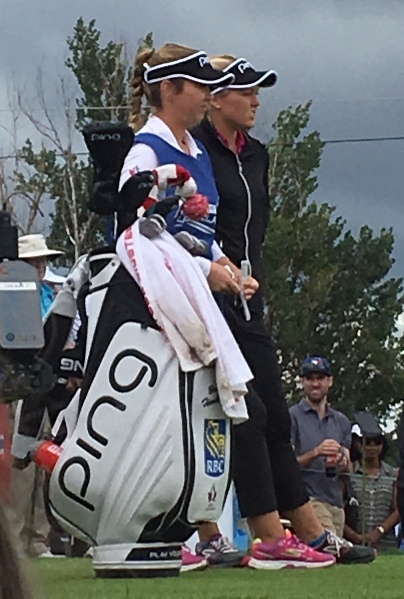 Brittany & Brooke Henderson at the Manulife Classic. I asked her if she felt she was being given enough credit for the sacrifice she’s made. I tried to dig a little deeper into their relationship. I asked if there aren’t times when they get on each other’s nerves on the road, or have strong disagreements about how to play a shot or read a putt. Doesn’t she miss having just a “normal” life, hanging out with her pals in Smiths Falls, spending weekends at the cottage? She looked at me like I was insane (not an unrealistic view, to be honest). Because it was time to go and help Brooke on the putting green, I didn’t get a chance to ask Britt about how the other Tour players look on the Hendersons… like, with envy, spite, or joy at what they’ve done so far? I expect Britt’s answer would have been “gee, you’d have to ask them”, but I also suspect I know that the answer is a combination of all three, with emphasis on the latter. 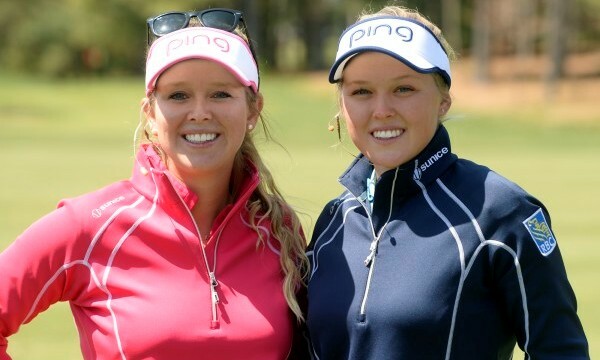 It’s quite clear from watching – even without the bias of being Canadian – that this sister act is working well on and off the course, and playing well to galleries everywhere. Brooke’s play is phenomenal, her smile and warmth are quite intoxicating, and her sister’s quiet strength, sense of duty, and steady hand on the wheel of the bus mean that this team is headed straight in the right direction. So next time you see Brooke do something remarkable, remember that it probably wouldn’t be happening without Britt holding the bag a couple of feet away.